When it comes to mobile browsers, WebKit has fast become the de facto technology for most big smartphone platforms. From red-hot Android(s goog) to astonishing iOS(s aapl) to beleaguered Symbian (s nok) and Blackberry(s rimm), they have all turned to WebKit for their mobile browsing needs. You wouldn’t be remiss in assuming that Apple and Google are WebKit’s biggest champions — because they are. These days, WebKit has a new best friend, San Diego-based chip maker Qualcomm(s qcom). Qualcomm isn’t doing this through the goodness of its heart; the company realizes it needs to help nurture HTML5. Qualcomm, Chandhok pointed out, wants to make it easy to access system-level components such as the graphics processor (GPU), GPS, compass and camera in the browser for web-based apps. Chandhok hopes the company can allow HTML5 apps to come into their own, and much like the wired web, turn the browser into the center of mobile internet experience versus the so-called native apps. “HTML5 and the browser will win over time. Maybe not this year, but it will happen,” he said. 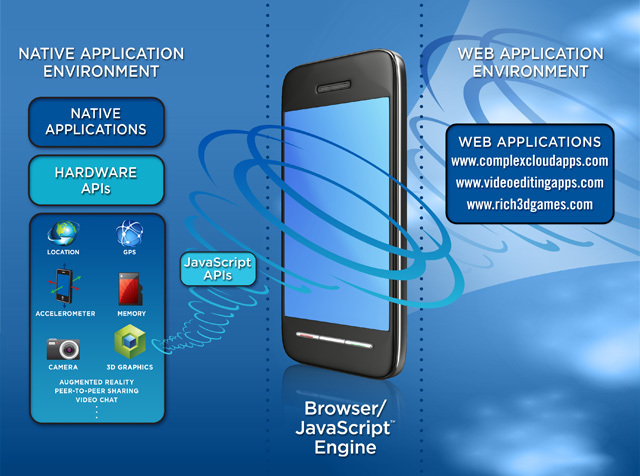 As Rob pointed out, HTML5 apps help app developers easily overcome the fragmentation challenges of Android and issues that come up with developing for multiple mobile platforms. “We had fragmentation problems in the early days of Brew (a Qualcomm-owned OS) because we didn’t have no leverage in the early days,” Chandhok said. When I asked him about the possibilities with HTML5 apps, he pointed out that “the Amazon (s amzn) cloud reader is a good starting point.” WebKit isn’t the only software initiative for the chip giant, however. “In order for us to be a platform, we need to have software along with our silicon,” Chandhok said. The company today has more than 5,000 employees devoted to its software efforts and is said to be one of the most active contributors to the Android ecosystem. If Qualcomm is reticent to share any details, it’s because the company also sells silicon to people who make non-Android devices. Chandhok isn’t too shy to admit that the more folks use the mobile internet and the higher their expectations for HTML5 apps, the more likely they are to buy smartphones with better processors, bigger screens and higher-speed capabilities. And all that means more demand for their chips. Uh, no, I’m sure I didn’t say that.. The flexibility of HTML vs the convenience of apps is not going to be an easy fight for the browser. Also, apps live in an ecosystem with a sound biz model around them. That said, the cloud could become relevant for the mobile internet as well. But the cloud faces big hurdles from both Apple and Google (and probably Windows as well), so unless something earth shattering happens, the browser is not unlike the swiss-army knife in your travel pouch whereas you use a bunch of regular knives and various tools(apps) in your daily life. “..didn’t have no leverage..” is that verbatim? You do know that Webkit came from Apple who open sourced it right? Because it doesn’t sound like it. It originated from KDE (a variant of linux) and Apple used those core technologies to build Safari and helped popularize it with Apple user base! For the record, KHTML originated from KDE (not a variant of Linux), but it wasn’t compatible enough for anyone to use over Mozilla Firefox. Apple, in need of a browser, chose KHTML as a starting point for their WebKit (___Kit is the standard nomenclature for many of Apple’s frameworks). In the process they fixed a lot of bugs and divorce it from the dependencies on Qt, but presumably this was preferable to adapting the heavyweight Mozilla code. Webkit was Apple’s fork of KDE project’s KHTML efforts. In the beginning, they weren’t a good member in the KHTML community. Eventually, the Apple agreed to open up Webkit development, and the KDE folks agreed to make Apple’s fork the official branch, or something like that. Thanks for the comment, Bob. We try to get everything copyedited as quickly as possible, but sometimes are catching things on the backend.